Emergy-emdollar evaluation is introduced including concepts and instructions for making calculations. Because of the universal hierarchy of energy, work on any scale of the environment or within the economy may be compared on a common basis by expressing products and services in emergy units. Emergy is the available energy (exergy) of one kind previously required to be used up directly and indirectly to make the product or service. Quality of anything is measured by the emergy per unit. Emergy measures real wealth, and emergy per person measures standard of living. Emergy per unit money measures real wealth buying power and is used to calculate emdollars, the economic equivalent. Whereas real wealth of environmental resources is inverse to monetary costs and prices, emdollars indicate their true contribution to the human economy. Emergy/money ratios vary greatly among nations, causing great inequities in foreign trade and investments. Public policy on any scale can be successful by maximizing emdollars. This article illustrates calculation and use of emergy-emdollars with an evaluation of shrimp aquaculture in Ecuador. It may be appropriate to a book on green accounting to explain emergy-emdollar accounting as the fundamental natural value to which people ultimately adapt. This article introduces the concepts and explains how to make the calculations with an example of shrimp mariculture, and uses its emergy indices to judge its value to local, regional, national, international, and global scale systems. For convenience of readers, a glossary is included as Appendix A. The concepts and definitions introduced here in words are given in equation form in Appendix B. A century of previous efforts to use energy for evaluation  failed because all kinds of available energy = exergy were regarded as equivalent measures of useful work. Starting in 1967, we used the term embodied energy for the calories (or joules) of one kind of energy required to make those of another, but that same name was used by others for some different ways of thinking and calculating. In 1983 we chose a new name, emergy (spelled with an "m") suggested by David Scienceman of Australia. In papers and books since, many groups around the world used emergy spelled with an "m" to mean the "energy memory" of what was required of one type of energy to make another. Since there is available energy in everything that is recognizable (even information), an energy-based measure, emergy, spelled with an "m," can be used to evaluate real wealth on a common basis, but calories of different kinds are not added. Emergy recognizes and measures the universal energy hierarchy, which should be regarded as a 5th energy law. Systems of nature and humanity on all scales are part of a universal energy hierarchy, which is the network of energy transformation processes which joins small scales to larger scales, and these to even larger scales. We represent everything in systems diagrams from small on the left to larger on the right. Available energy (potential energy = exergy) at one level is used up in each transformation process to generate a smaller amount at the next larger scale. Self organization reinforces designs in which the higher quality energies on the right feed back to the left to reinforce the input process (autocatalytic feedback). Calories of energy of different kinds are not equivalent in their contribution of useful work. Directly and indirectly it takes about 1000 kilocalories of sunlight to make a kilocalorie of spatially dispersed organic matter, about 40,000 to make a kilocalorie of coal, about 170,000 kilocalories to make a kilocalorie of electrical power, and 10 million or more to support a typical kilocalorie of human service. The larger the scale, the higher the quality of the energy, but the less there is of it. There is less energy but more emergy per unit in valuable things. The numbers are largest for genetic information. Thus, the emergy of anything is the available energy (potential energy = exergy) of one kind previously used up to make it. For example, the solar energy previously required is called the solar emergy. To keep from confusing energy that is in a product with that which has been used up to make it, emergy units are called emcalories (or emjoules). The emergy of one kind required to be transformed to make one unit of energy of another is called the transformity. In this article solar insolation emergy is used as the common measure. Solar transformities are used = solar emergy per unit energy, and the units are solar emjoules per joule. Transformity measures the quality of energy and its position in the universal energy hierarchy. Since people don't think in emergy units, the economic equivalent called the emdollar is obtained by dividing emergy by the ratio of emergy to money in the economy. Emdollars are the economic equivalent of emergy. Emdollars indicate the money circulation whose buying power is supplied by use of a quantity of emergy. Emdollars are estimated from emergy and vice versa using emergy/money ratios for the economy concerned. The global emergy/money ratio was evaluated as 1.1 x 1012 sej/$ in 2000  with 70% of the whole world's annual real wealth use coming from non-renewable fuels and materials and 30% from the renewable environment (sun, tide, and earth heat). Emergy can be identified as the correct measure of real wealth, because successful surviving designs in self organization of nature and the economy are those that maximize emergy power (empower) on every scale. (Maximum empower updates the maximum power principle introduced by Alfred Lotka as the 4th energy law ). Humans in the short range may evaluate products and services in other ways, often expressing their choices with market values, but in the longer range and the larger scale of societies and their environment, they are forced by trial and error or by logic to fit their ideas and behavior to maximize empower. To determine whether something makes a net contribution to the economy, everything can be put in solar emergy units. Then you can correctly compare the yield to the economy with what was required to be purchased from the economy. Fossil fuels, depending on their concentration and price, provide 3-15 times more emergy than the economy uses to get and process them. Oil from oil shale and photovoltaic electricity have no net emergy contribution. They yield less emergy to the economy than is required in emergy of materials and services to operate them. Thus, they cannot independently support the economy nor become economical as primary sources. Emergy evaluates exchanges on a common basis. There are large inequities in real wealth of international trade. Developed nations using raw products of some less developed nations take many times more emergy from those economies than is in the buying power of the money they pay in exchange. A full explanation of energy hierarchy and emergy evaluation and a summary of that literature is available in a 1996 book . This article is a condensation. A system of interest is selected and main components, inputs, and outputs are identified. An energy systems diagram is drawn with main parts and pathways (example in Figure 1). The dozen symbols suggested for the diagram have been in wide use since 1965 and explained in various books [5, 6, 11]. The boundary selected for the diagram is used to identify all the important input pathways crossing into the chosen system. Each of these inputs becomes a line item in an evaluation table (example in Table 1). If there is a stored quantity within the boundary which is supplying available energy and/or materials faster than it is being restored, it is acting as a non-renewable source and is included as a line item. In column #4, emergy per unit (g, J, $, etc.) is inserted from previous studies and the source cited in the footnote for that line item. The input requirements in column 3 are multiplied by the emergy/unit values in column 4 to obtain the emergy flow = empower value (in solar emjoules per year) for column #5. For inputs where the data are in money units representing services, the money flow, converted according to the currency exchange into international dollars, is multiplied by the emergy/money ratio (sej/$) of the economy from which the human services were contributed. Annual emdollar flows are calculated in the last column of the evaluation table (column #6 in Table 1) by dividing by the emergy/money ratio of the economy of the intended audience (example: 1.0 x 1012 sej/yr 2000 $) to obtain annual emdollars (abbreviated em$) for Column #6. Emergy/money ratios come from emergy evaluations of whole nations. Some of these have been published , and there are summary tables [5, 13, 14]. An interpolation Appendix table in reference  evaluates the U.S. emergy/money ratio for different years from the total fuel use and gross economic product. Larvae can be thought about as information packages with little energy. When a shrimp releases many larvae, this represents a split of the Emergy. Each tiny new individual carries an information copy. If the population is at steady state, the larvae grow and are depleted in number by mortality, eventually replacing two adults. This is a closed life cycle dependent on all the inputs necessary for the whole sequence. The emergy per individual grows, reaching a maximum at reproduction. Assuming 2 individuals finally restore 1 adult, emergy for the post-larvae is half that of the reproducing adult before harvest. 5. Transformity of labor in Ecuador was estimated as national emergy/person/yr . Much of the fish meal came from herring, sardines, etc., mostly beyond the continental shelf. A solar transformity was estimated using organic carbon per square meter in herring sardines and anchovettas yield from the pelagic upwelling system published by Walsh (1981)  divided by the solar emergy of the current. Emergy of direct solar energy, and chemical energy of rain were also evaluated, but were less than the physical energy of the Humboldt current. As lesser by-products of the world weather system, direct sun and oceanic rain were omitted to avoid double counting. Solar emergy input per square meter of pelagic ecosystem generating this meal includes direct sun, rain, and the physical energy being used from the several sources driving the Humboldt current, the waves, and upwelling. The circulation of the east Pacific gyral includes wind energy transferred from the large scale circulation of the atmosphere wind plus large scale pressure gradients maintained by density differences due to temperature and salinity differences. The physical energy was estimated by assuming a fraction of 1% of the kinetic energy used up per day in steady state with the sources. The emergy of the direct sun and direct rain are small by comparison. Solar transformity of rain over land was calculated as the quotient of the earth's annual emergy divided by the Gibbs free energy of the rain over land relative to sea water. Rain over ocean was assumed 71/29 of 1.05 E14 m3/yr rain over land in proportion to the ocean/land areas. For evaluating emergy, use 8.7 sej/$ within Ecuador . An energy systems diagram is drawn summarizing the environmental and purchased inputs, the money flows, yields, and by-products, all given in annual empower units (example in Figure 2). Numerical emergy values are written on the pathways to give an overview perspective and make it easy to calculate emergy indices. To evaluate the emergy stored in resource reserves, capital assets, organisms, diversity, information, etc, an emergy storage table is prepared. It has the same columns as in the emergy flow (empower) table except columns #3, #5, and #6 have stored quantities rather than flow rates. The following are emergy indices calculated from the evaluation table and used to draw inferences from emergy analyses (Figure 2). To evaluate the quality of the energy flows, transformities can be calculated and compared with other energy forms. The solar transformity of services and products generated by the system under study is obtained by dividing the total emergy input required by the energy of the product or service. For interpretation of net benefit, the net emergy ratio is calculated. The emergy yield ratio is the emergy of an output divided by the emergy of those inputs to the process that are fed back from the economy (Y/F in Figure 2). This ratio indicates whether the process can compete in supplying a primary energy source for an economy. Recently the ratio for typical competitive sources of fuels has been about 6 to 1 or higher. Processes yielding less than this are not economical as primary emergy sources. To anticipate whether an investment is well matched by free resources, the emergy investment ratio is calculated. The emergy investment ratio is the ratio of the emergy fed back from the economy to the emergy inputs from the free environment (F/E in Figure 2). This ratio indicates if the process is economical as utilizer of the economy's investments in comparison to alternatives. To be economical, the process should have a similar ratio to other regional activities. If it takes more from the economy than alternatives, it will not survive the high costs. If it receives less from the economy, the ratio is less, its costs are less so that it will tend to compete, prosper in the market, and increase its investment. The emergy exchange ratio is the ratio of emergy received for emergy delivered in a trade or sales transaction. Raw products such as minerals, rural products from agriculture, fisheries, and forestry, all tend to have high emergy exchange ratios when purchased at market price. Money is only paid for the human services and not for the extensive work of nature that contributed to these products. An emergy flow may be a benefit or a loss depending on the area and scale of view. Something can be a loss from one area that benefits another. An emergy flow may have one benefit to a small area but have a different benefit when considered within the larger system. See example in Table 3. The following evaluation of shrimp aquaculture and its foreign trade is summarized from a previous publication . The shrimp example highlights recurring problems with environmental development, international aid, and investment. Thousands of ponds were built in the coastal zone of Ecuador, displacing the mangrove swamps that had been supporting local people with food, fuels, and environmental services. Shrimp mariculture in 1986 was based on getting the post-larval shrimp from the natural system, which also supported an older trawl shrimp fishery. Understanding shrimp ponds, their estuarine basis, and their relationship to the international economy requires systems thinking and wealth evaluations at several levels of size: the pond system, the regional economy, the national economy, international exchange and the world economy. Ideally, a new development should contribute to the wealth of all these, without one at the expense of another. Maximizing one may not maximize the whole system's wealth and performance. Nor are such developments sustainable. The parts and processes of shrimp systems are shown with the energy systems diagram in Figures 1 and 2, using the energy systems symbols. The diagram shows causal relationships. Minor parts are never intentionally left out, but they may be aggregated with other items to keep the overview simple. The input pathways are the line items in the emergy evaluation Table 1. Circles outside the defined boundary frame are sources of external resources, goods, and services; tank symbols are for stocks and storages; pointed blocks are interactions of more than one commodity or factor in productive processes. Hierarchy within each diagram is represented by the position of symbols with increasing scale of territory and turnover time from left to right. Previous books have more on use of symbols, mathematical equivalents, and their computer simulation [3, 12]. In the diagram of the shrimp ponds (Figure 1) estuarine waters containing post larvae, shrimp food and fertilizer nutrients are pumped into the diked ponds. More organic food is generated by the pond algae and other plants. The pond managers add additional fertilizer, foods, post-larvae, utilizing goods and services, fuels, and electricity. Harvested shrimp are sold, and the money obtained is used to buy purchased items, pay interest and repay loans, with the balance retained as profit. Flows of emergy are evaluated in Table 1, grouped in three headings: environmental inputs, items purchased from the local economy, and output products. The annual emergy flows (empower) from column 5 are plotted on the pathways in Figure 1. After dividing by the area of ponds, the annual emergy per hectare was plotted on the summary diagram in Figure 2. The total emdollars used expressed in U.S. dollars of year 2000 was 2,147 em$ per hectare per year, four times the economic costs. Table 2 has the emergy indices calculated from the totals in Figure 2. The emergy yield ratios are small, not unlike industrialized agriculture. The emergy investment ratios are about half those of the United States (7.0), but for Ecuador they indicate relatively high levels of economic intensity and environmental impact. Transformities are similar to other agricultural protein sources (beef, lamb). The effect of organic feed was evaluated by calculating the ratio of the emergy increase in yield divided by the emergy of the added fish meal. The organic feed amplified the production of the pond system 2.8 times. The U.S. economy and standard of living was enriched, and that of local people formerly using the coastal zone of Ecuador was depleted. Whether a flow of real wealth evaluated as emergy is a benefit or a loss may depend on the scale of viewpoint. The emergy of the shrimp aquaculture is considered with five viewpoints in Table 3. 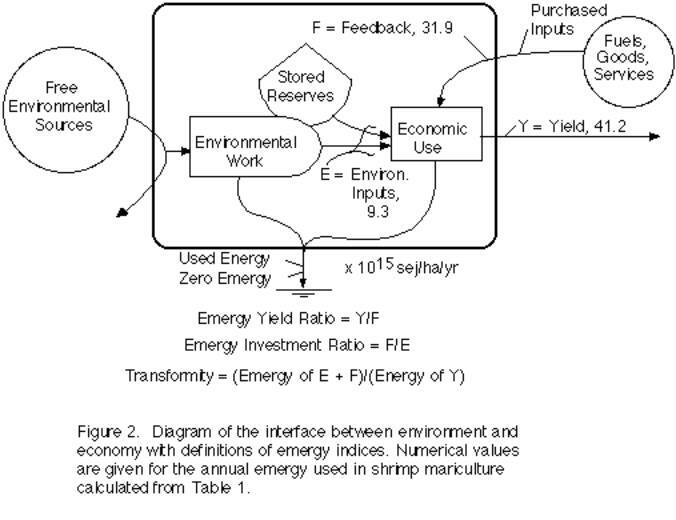 As illustrated with the shrimp evaluation example (Figures 1 and 2 and Table 1), ordinary kinds of data on materials, energy, and money are used in emergy evaluations and then multiplied by a unit emergy value (example emergy/energy = transformity, emergy/money, emergy per mass, emergy per individual, emergy per bit, etc.). Each emergy evaluation table generates some new unit emergy values for the systems products. For example, transformities for shrimp in Table 2 were obtained from Table 1. Tables of transformities and other unit emergy values from previous emergy evaluations are available  and others are being assembled as part of a new Handbook of Emergy Evaluation issued in folios [13, 14]. There are other procedures for estimating unit emergy values, including 10 given in the 1996 book . For example, the Tennenbaum track-sum method calculates the emergy of a pathway by tracing and adding the emergy of each outside input through the system to reach the pathway one by one. A method from Murray Patterson modified by Collins  evaluates transformities as the eigenvalues from data in a matrix of transformities and energy transformation data. Others use the inverse property of energy use and transformity . As mentioned at the start, transformities measure the position in the universal hierarchy of energy, thus measuring fundamental properties of earth and cosmos. Concepts of environmental and economic accounting on a common basis are explained and illustrated with an evaluation of shrimp mariculture in Ecuador. The principles of energy hierarchy are used to express real wealth value in units of emergy and their economic equivalent emdollars. Public policy can anticipate successful fit of economy and environment by selecting alternatives that maximize production and use of emergy-emdollars. Appendix A - Glossary (Modified from Dan Campbell 1996 ). Available energy - Energy with the potential to do work (exergy). Donor value - A value of a product determined by the production process and not by what a person is willing to pay (examples, mass and energy of wood). Emdollar value - Dollars of gross economic product obtained by dividing the emergy of a product by the appropriate emergy/money ratio. The dollars of gross economic product equivalent to the wealth measured in emergy units. Emergy (spelled with an "M") - All the available energy that was used in the work of making a product directly and indirectly expressed in units of one type of available energy. Emergy exchange ratio - Ratio of emergy received to emergy paid out in barter, trade, purchases, or other exchanges. Emjoule - The unit of emergy; a joule of available energy of one kind of energy previously used up to make a service or product. Energy - A property of all systems which can be turned into heat and measured in heat units (Calories, BTUs or joules). Energy hierarchy - The convergence and transformation of energy from many small units into smaller amounts of higher-level types of energy (often in units of larger size) with greater ability to interact with and control smaller units. Energy systems diagrams using energy circuit symbols - General systems overview for representing parts and connections of any system, including flows and storages of materials, energy, information, and money (Figure 4). Exergy - Available energy - Energy with the potential to do useful work and which is used up in the process. Gross economic product - The total market value of all final goods and services produced in an economy in one year. Investment ratio (emergy investment ratio) - The ratio of emergy brought into an area from outside its economy to the local, free environmental emergy used in the interaction processes. Maximizing emergy - The process by which the maximum power principle operates within a system to select from among the available components and interactions the combination that results in production of the most emergy. Maximum empower principle - Self organization selects designs by reinforcing network pathways that maximize empower. This is a clarification of the maximum power principle to recognize that each level in the natural energy hierarchy self organizes with the same principle at the same time. Maximum power principle - An explanation from Alfred Lotka and others for the designs observed in self organizing systems (energy transformations, hierarchical patterns, feedback controls, amplifier actions, etc.). Designs prevail because they draw in more available energy and use it with more efficiency than alternatives. Net emergy - The emergy yield from a resource after all the emergy used in the process has been subtracted. Net emergy ratio (Emergy yield ratio) - The ratio of the emergy yield to that required for processing. Real wealth - Entities and flows containing available energy (exergy) capable of depreciating according to the second Law; usable products and services; Examples: food, fuels, material concentrations, houses, organisms, information, land, labor, controls. Reinforce - The action of a unit or process to enhance production and survival of a contributing unit or process, thereby enhancing itself; a loop of mutually enhancing interactions. Second law of thermodynamics - Principle that energy concentrations disperse spontaneously, and in all energy transformations some of the available energy is dispersed in the process. Self organization - The process by which systems use energy to develop structure and organization. Solar emergy - Solar energy required directly and indirectly to make a product or service. Units are solar emjoules (abbreviated sej or semj) or solar emcalories (abbreviated secal or semcal). Solar transformity - Solar emergy per unit energy, expressed in solar emjoules per joule (sej/J). Sustainable use - Resource use that can be continued by society in the long run because the use level and system design allow resources to be renewed by natural or man-aided processes. Systems ecology - The field which came from the union of systems theory and ecology and provides a world view for energy analysis. Transformity - The emergy of one type required to make a unit of energy of another type. E.g., since three coal joules and one coal emjoules of services are required to generate one joule of electricity, the coal transformity of electricity is four coal emjoules per joule. Turnover time or replacement time - The time for a flow to replace a stored quantity. For example, a flow of 10 gallons of water per day will replace a 1000 gallon tank of water in 100 days. Wealth - Ambiguous term which needs an adjective to distinguish monetary wealth (state of being rich with money) from real wealth (definition above). Emergy, a measure of real wealth, is defined as sum of the available energy of one kind previously required directly and indirectly through input pathways to make a product or service (unit: emjoules). In most recent papers solar emergy (Ems) is used with the unit solar emjoule (abbreviation: sej). Empower(Jems) is the emergy flow per unit time (units: solar emjoules per year (abbreviation: sej/yr). where Trs = solar transformity and Je is a flow of available energy. Transformity is the emergy per unit available energy (emergy per unit exergy). Example: solar transformity in solar emjoules per joule (abbreviation: sej/J). Transformity is the intensive unit of emergy and measures the quality of energy [6 ?]. Emergy per unit mass, is useful where data are in mass units. Emergy/money ratio (Ems/$) is a measure of the real wealth buying power of money calculated for a state or nation in a given year. It is useful where data on human services are in money units. Emdollars(abbreviation Em$) are the dollars of gross economic product based on a contribution of emergy. Net emergy ratio is the ratio of the yield emergy (Yem) to the emergy of inputs purchased and fed back from the economy (Fem). This ratio measures the net contribution to the economy or loss from it. Emergy Investment Ratio is the ratio of inputs purchased and fed back from the economy (Fem) divided by the free environmental emergy input (Iem). It is a measure of economic viability. This ratio is low when the environmental source is providing more so that costs are less. Brown, M.T. and S. Ulgiati. 1999. Emergy evaluation of the biosphere and natural capital AMBIO 28(6):468-493. Collins, D. and H.T. Odum. 2001. Calculating transformities with an eigenvector method. pp. 265-279 in Emergy Synthesis, ed. by M.T. Brown, Center for Environmental Policy, Univ. of Florida, Gainesville, in press. Lotka, A.J. 1922. A contribution to the energetics of evolution. Proc. National Academy of Sciences, U.S., 8:147-155. Lotka, A.J. 1925. Physical Biology. Williams and Wilkins, Baltimore, MD. Martinez-Alier, J. 1987. Ecological Economics. Basil Blackwell, NY, 286 pp. Odum, H.T. 1971. Environment, Power, and Society. John Wiley, NY, 336 pp. Odum, H.T. 1983. Systems Ecology. John Wiley, NY, 644 pp; revised in 1994. Ecological and General Systems: An Introduction to Systems Ecology. Univ. Press of Colo., P.O. Box 849, Niwot, 80544. Odum, H.T. 1988. Self organization, transformity, and information. Science 242:1132-1139. Odum, H.T., E.C. Odum, and M. Blissett, eds. 1987. Ecology and Economy: Emergy Analysis and Public Policy in Texas. LBJ School of Public Affairs and Texas Dept. of Agriculture, Policy Research Publication No. 78, Univ. of Texas, Austin, 178 pp. Odum, H.T. and J.E. Arding. 1989. 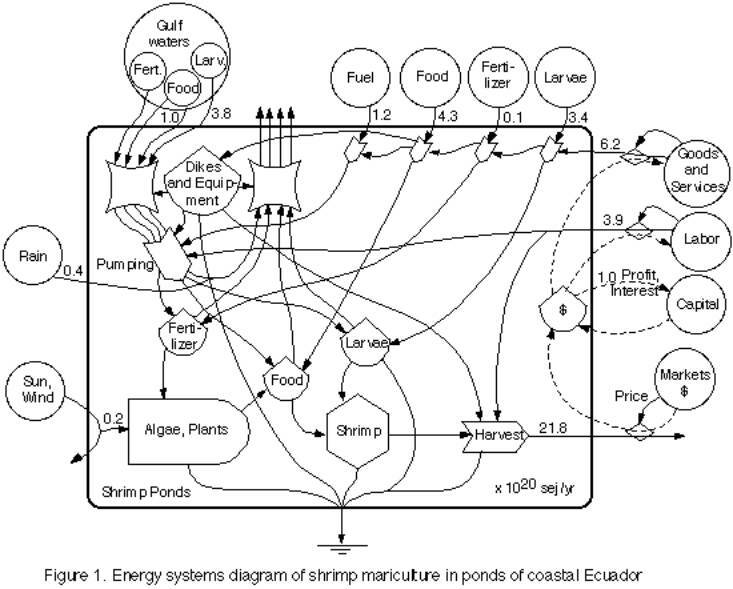 Emergy Analysis of Shrimp Mariculture in Ecuador. Working paper, Coastal Resources Center, Univ. of Rhode Island, Narragansett, 111 pp. Odum, H.T. 1996. Environmental Accounting, Emergy and Decision Making. J. Wiley, NY, 370 pages. ISBN-471-11442-1. Odum, H.T. 2000. Emergy evaluation of an OTEC electrical power system. Energy 25:3989-393. Odum, H.T. and E.C. Odum. 2000. Modeling for All Scales, An Introduction to Simulation. Academic Press, San diego CA, 458 pp. Odum, H.T., M.T. Brown, and Sherry Brandt-Williams. 2000. Introduction and Global Budget, Folio #1, Handbook of Emergy Evaluation. Center for Environmental Policy, Environmental Engineering Sciences, Univ. of Florida, Gainesville, 16 pp. Odum, H.T. 2000. Emergy of Global Processes, Folio #2, Handbook of Emergy Evaluation, Center for Environmental Policy, Environmental Engineering Sciences, Univ. of Florida, Gainesville, 30 pp. Odum, H.T. 2001. An Energy Hierarchy Law for Biogeochemical Cycles. pp. 235-247 in Emergy Synthesis, ed. by M.T. Brown, Center for Environmental Policy, Univ. of Florida, Gainesville, in press. Walsh, J.J. 1981. A carbon budget for overfishing off Peru. Nature 290(5804):300-394.